My sister-in-law left this package in our fridge. Perfect for when you have a last minute craving for soup: no cooking required! I'm not usually a big fan of pre-made soups, but this one was delicious, plus it's from a canadian company that focusses on organic, planet-friendly food. We started with a farmful of organic carrots, a blender and the dream of the world as a happier place. 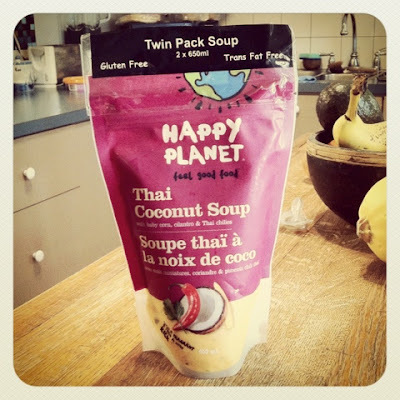 Today Happy Planet makes smoothies, juices, soups and health shots - all fresh and all good. Mission: We make food and juice that makes you smile. It has to do you good and taste great - that's Happy Planet. Description: Two boys, Randal Ius and Gregor Robertson, started out in 1994 with a farm full of organic carrots, a blender, a somewhat ambitious dream to make the world a better place and hopefully make some money too. The idea was to connect big city people back to the land, to farmers who produced great produce that went in foods which tasted good and did some good. They called the company Happy Planet. Posted in "Happy Planet", "Vegan"